Although vaccines are among the safest, most effective ways to protect children from major communicable diseases, many parents, for reasons that range from ill-informed to infuriating, still doubt this. As a result, many choose immunization schedules that defy science or refuse to vaccinate altogether. “These kinds of clusters can be associated with later epidemics." If these parents were distributed randomly, their decisions would be less likely to harm others, especially babies too young for vaccination. But as previous studies have shown, parents who use “personal belief exemptions” to avoid school vaccination requirements often live in the same communities. Now, in a study published Monday in the journal Pediatrics, researchers have (perhaps not surprisingly) found the same phenomenon among parents of infants and toddlers. These younger children face the highest risk of dying from whooping cough and other vaccine-preventable diseases. The study has come out as the state is grappling with a measles outbreak linked to people who visited Disneyland in mid-December. Dr. Tracy Lieu, director of Kaiser's Division of Research, led the research team. They knew that places like Marin and Sonoma counties had higher rates of personal belief exemptions, she says. But those parents probably refused those vaccines some years ago, Lieu says. Her team hoped to spot clusters of refusal earlier, when recommended vaccines are due, so they could take steps to ward off outbreaks. To look for at-risk communities, Lieu and her colleagues analyzed the medical records of 155,000 children in Kaiser's system who lived in 13 Northern California counties and were born between 2000 and 2011. They were looking both for children who had received no vaccines and for children who had been "under-immunized," meaning they had missed one or more shots by age three. Researchers then matched these children's vaccination records to their addresses, to see if these children were clustered geographically. Across the 13 counties analyzed, the proportion of children who’d missed one or more shots increased from an average of 8 percent at the beginning of the study period to 12.4 percent at the end. But that's a broad geographic range. 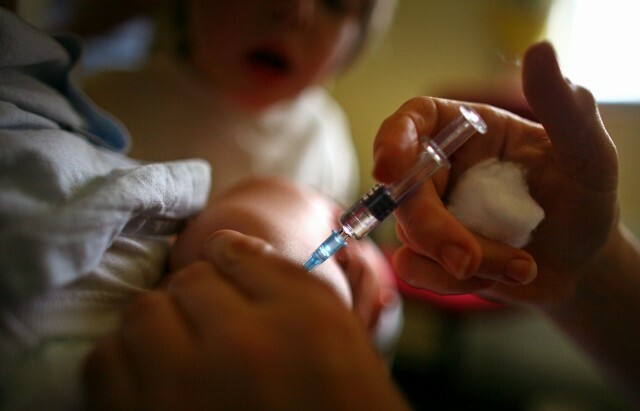 When the researchers drilled down to the county level, they found pockets of even higher rates of under-immunization ranging from 9.2 percent in Santa Clara County to 17.9 percent in Marin County between 2010 and 2012. Five hot spots stood out between 2010 and 2012, including a 1.8-mile area in Vallejo, where 22.7 percent of kids were under-vaccinated. More than 10,000 toddlers lived within these five clusters. When Lieu’s group analyzed vaccination against specific diseases, they found that under-vaccination rates for the MMR vaccine – which protects against measles, mumps and rubella – were 1.69 times higher for children living in Marin and Sonoma counties compared with other areas. The Disneyland measles outbreak is a stark reminder that pathogens can gain a foothold where vulnerable people congregate. That’s why states require children to be fully vaccinated before entering kindergarten. The easier it is to opt out of these mandates, the more likely disease will follow. “Not surprisingly, areas that are under-immunized directly correlate with those areas at greatest risk of infections when they occur,” says Dr. Paul Offit, who directs the Vaccine Education Center at Children’s Hospital of Philadelphia and was not associated with the study. When enough people stop vaccinating, he says, measles and whooping cough, among the most contagious diseases, rapidly exploit holes in community, or herd, immunity. Last year, when a record number of California parents claimed personal belief exemptions, health officials reported the most measles cases seen here since 1995 and the most whooping cough cases since 1947. Marin, Napa and Sonoma counties -- where Lieu and her team found under-immunization clusters ranging from 17.5 to 18.1 percent between 2010 and 2012 -- had the highest rates of whooping cough in the state in 2014. During the same time, a review of state immunization records shows, vaccination rates for whooping cough at nearly two-thirds of Marin schools, a third of Napa schools and 37 percent of Sonoma schools fell below targets to halt disease spread. Prof. Saad Omer at Emory University earlier found that clusters of personal belief exemptions contributed to the 2010 California whooping cough epidemic that killed 10 babies. Omer says that by using electronic medical records, Lieu and her team have developed a tool that can estimate risk earlier, without having to wait until children enter school. Children on chemo or who have other genuine medical reasons for exemption are particularly vulnerable when they interact with unvaccinated people, whether at school or places like Disneyland. Some parents think measles isn’t such a big risk, Offit says. And compared to the pre-vaccine days, he says, when every year millions of children got sick, 48,000 were hospitalized and 500 died, that’s true. But as a veteran of the 1991 Philadelphia measles epidemic that infected 1,400 and killed nine children who weren’t immunized, Offit cautions that playing the odds is a dangerous game. But increasingly, pediatricians, including Offit’s wife, Bonnie, refuse to help parents do that. The alternative is to sit back and let parents make bad decisions. Liza Gross is an independent science journalist based in the San Francisco Bay area who writes frequently about science and society.